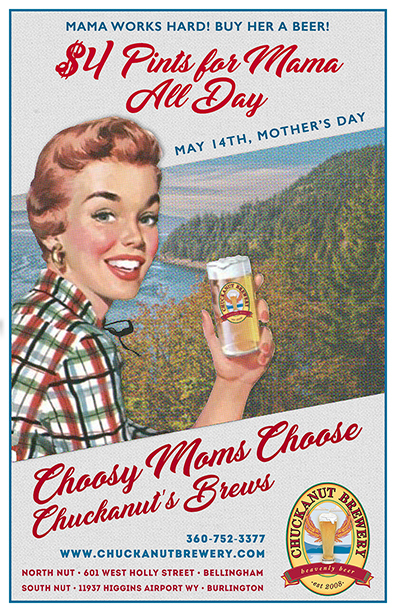 Choosy mom's choose Chuckanut Brews indeed! And we'll help her out by offering $4 Pints all day for Moms on Mother's Day May 14. Bring mom in to North Nut to enjoy our seafood specials or something off the menu or stop by South Nut for some pints and enjoy the cozy atmosphere. If you're planning a big dinner at home in honor of mom bring your growlers in to be filled or get some of our half liter bottles. Whatever you do make sure to show your appreciation for your mom, she deserves it! Friends from Cloudburst Brewing in Seattle got together with us to create this new Southern Hemisphere lager. Light golden with a creamy white head this beer has lots of tropical fruit notes of fragrant grapefruit and guava due to the use of New Zealand and Australian hops (Galaxy, Kohatu, Motueka, Nelson Sauvin, and Rakau). 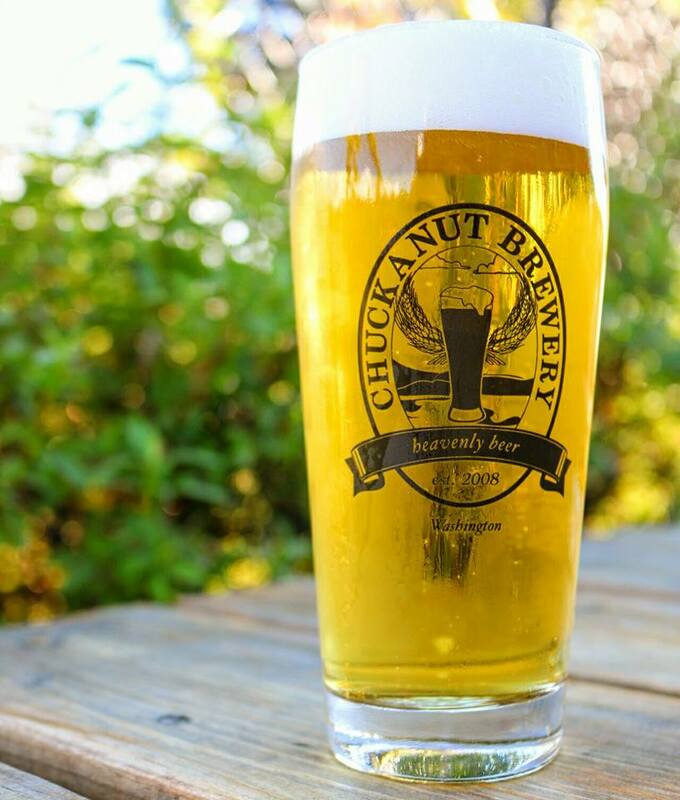 A marriage of Chuckanut's clean, crisp lager with Cloudburst' hop expertise culminating in a very drinkable down under lager! We'll be tapping Nut Burst on Mother's Day May 14. This beer is a limited production lager and will only be available at North and South Nut, Cloudburst Brewing in Seattle and selected accounts around Puget Sound. May has come and with it our vegetarian Cascadia farms mushroom (shiitake, oyster & pioppino) white sauce pizza topped with Holmquist hazelnuts, mozzarella and Samish Bay queso fresco. There's nothing better in the spring then a fresh Asparagus soup, ours is made with leeks, tarragon, lemon & olive blended with organic asparagus into a creamy vegan dairy free soup. May's Caramel Malt Brulee uses Skagit Valley Malting Copeland barley malt married with housemade caramel & local cream finished with a candy crust. Our friends in Seattle know how to celebrate craft beer and there at it again May 5-14. 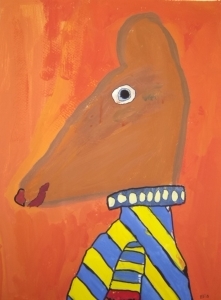 Chuckanut will show their support with a variety of events throughout the Seattle area. See our calendar above for the specifics and try to stop in to some of the activities for a good time and a toast to great craft beer! If you haven't had a chance to see inside our new brewery at the Port of Skagit you'll have another chance on May 20. Our new facility is more than twice as big as the brewery in Bellingham and uses all the hi-tec equipment that 's in our North Nut location but bigger! 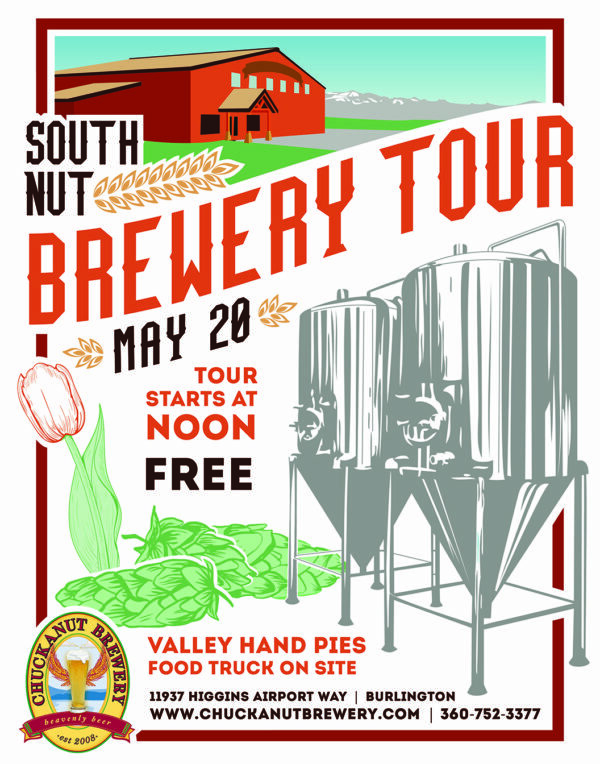 Stop in at noon to join the free tour and take advantage of Valley Hand Pies food truck with it's delicious English style individual pies parked out front. If you haven't tried their pies you might want to stop in on any Tuesday and Thursday when they are always on site. Sushi by Chin will be a regular on Mondays now, he's known throughout the Valley for excellent Sushi rolls. Also Friday to Sunday May 5-7 Big Red (Java Jo's) food truck will be stopping in to dish up burgers, sandwiches, and their famous chicken fajitas as well as specialty coffees.